The DFRobot LCD Keypad Shield for Arduino features a 16x2 character LCD display with analog pushbutton inputs. This Arduino Shield includes a 16 column by 2 row text character LCD display and 5 momentary push buttons connected to a single analog input. A contrast adjustment is provided and the backlight can be turned on or off to conserve energy. It also has a conveniently placed reset button, a power indicator LED and a set of male headers for to access to Arduino analog inputs. 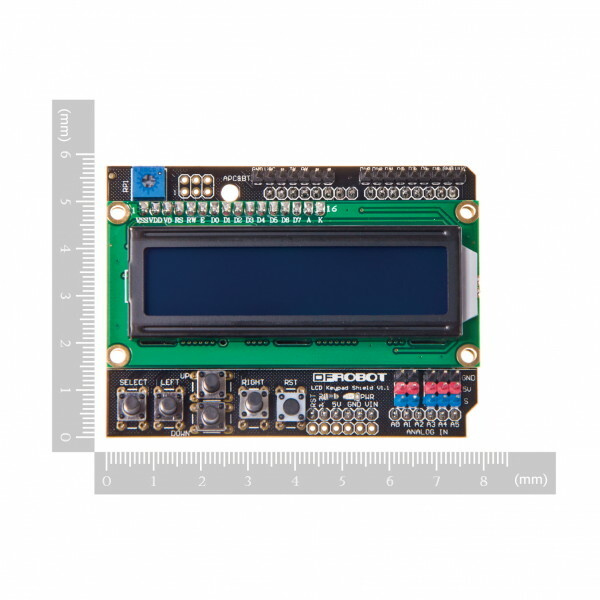 This shield uses an HD44780 compatible display controller that works with the standard Arduino LiquidCrystal display library.